← What Happened to Shauna on The Mindy Project? Once again, there are no words. None that could come close to describing the tragedy, the injustice, the simple and relentless pain that’s held within this photo. But what this picture represents- for that the world finally seems to be finding a voice. In Europe, the once mighty ranks of anti-refugee rallies have been utterly outstripped by the freshly galvanized pro-immigrant protesters. In Munich, German citizens have greeted weary evacuees with cheers, welcome banners, food, water, and toys. Even the goose-stepping Merkel and her xenophobic Christian Democratic Union party have been unable to quell public support. In Iceland, over 16,000 citizens have joined a movement to pressure their government to “open the gates” for Syrian refugees, with many Icelanders offering to pay for migrant transportation or even house them themselves. This is Bryndis Bjorgvinsdottir, one of the leaders of the movement and a goddamn hero. The likewise saintly former-president of Uruguay, Jose Mujica has offered his unused presidential palace (Mujica himself lives on a tiny chrysanthemum farm) to house 100 Syrian children. Pope Francis has called upon the whole of the Catholic Church to accept refugees. The conscience of the entire world is being put to the test. Aylan and Galips’ deaths- irrefutably tragic- have also helped call out Canadian PM Harper and his cronies on their draconian policies on asylum and immigration. Cartoonists and satirists have been swift to confront the Arab world on its own crocodile tears- the incredibly wealthy and unbelievably callous Gulf States in particular. After over 250,000 dead and millions fleeing, the world- at long last- is beginning to listen. And it’s vital that the world gets the right message here. While horror can move us, it can also paralyze us. It can cause us to at last open our arms to refugees, only to lose all hope for them being anything but refugees. Pity, rather than justice, becomes our goal, and images of drowned Syrians are at risk of being simply placed alongside those of starving Africans. The minute we do, we return to the same apathy and difference that resulted in the deaths of Aylan, Galip, and thousands of other would-be refugees. The minute we despair, we find ourselves willing to settle for anything that will be about the end of violence (rather than the beginnings of freedom). Already there are those who are calling the murderous dictator Assad the “lesser of two evils”, forgetting the very cause of the war. True peace- to paraphrase a wise man- is not the absence of conflict but the presence of justice, and it is that which needs to be our rallying cry. 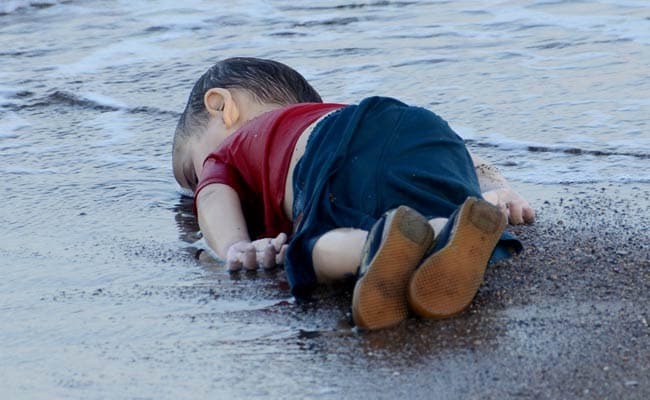 This entry was posted in Canada, Christianity, Europe, media, morality, news, politics, race and tagged Assad, Aylan Kurdi, Bashar el Assad, Bryndis Bjorgvinsdottir, Canada, Christian, Christianity, conservative, Galip Kurdi, German, Harper, Iceland, immigrant, immigration, Islam, Jose Mujica, justice, media, middle-east, Migrant, morality, Munich, Napalm, news, photo, photography, picture, politics, Pope Franics, race, racism, Refugee, Syria, Syrian, Turkey, uruguay. Bookmark the permalink.